Captain Greg Le Sieur is more than a ship captain; he is a knowledgeable tour guide who knows Cocoa Beach, Florida, and the rest of the Space Coast very well. Take some time to read his message to those looking for a maritime adventure, and what people who have toured with him have to say. I have loved the sea and sailing from the time I was a little boy growing up on the shores of Cape Cod. Most of my summer days were spent exploring the waters and islands of Pleasant Bay on small sailboats or rolling around Nantucket Sound with my dad, trying to catch blue fish (although we usually ended up only hooking a flounder or sea robin). My first taste of tall ship sailing came on a spring semester abroad in college, on the Sea Education Association's 125' staysail schooner, Westward, which was launched in 1961. On this boat I enjoyed a true ocean experience while learning the traditions of sailing windjammers. I cruised from Miami to the Bahamas, to Bermuda, to Nova Scotia, and finally ended up in Cape Cod. The Westward is currently used by Ocean Classroom. After this, I took to the sea for the better part of the next decade, sailing in California, Mexico, the Caribbean, the US East Coast, the bays of Maine, the Canadian Maritimes, and the Great Lakes. I began as a student and worked my way up to deckhand before finally receiving the title of captain. A few of my other ships include the US Brig Niagara, which is a 198', double-masted square rigger, and the Californian, a 148' square topsail schooner. I also sailed the Spirit of Massachusetts, a 125' gaff-topsail fishing schooner, and many others. Currently, I hold a 100-ton near-coastal master's license for motor and sail-auxiliary vessels. As much as I love sailing, I love people even more! People of all ages have a great, relaxing time on our family boat, and I look forward to spending a wonderful two hours with customers on Florida's sparkling waters. I hope to be able to share my passion for sailing with you, and I am happy to hear you share your interests with me as well! 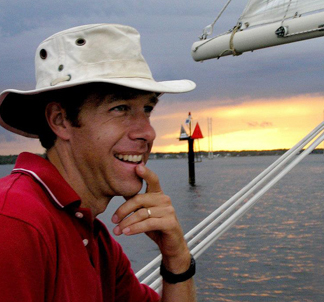 "Immediately Captain Greg made our entire crew feel at ease and at home on the water. He is an experienced and friendly guide who effortlessly launched us on a sailing adventure that we will remember forever. Shortly after we set sail Greg spotted some dolphins swimming in the distance. He took us a little out of the planned charter to get closer, knowing that our children were really excited at the possibility of seeing them in their natural environment. The dolphins swam right beside the boat jumping and diving for us! It was far more than I could have ever expected.